I got the notice from Eone's school about their costume for their culminating program only a week before the event. I was busy preparing for my son Enoe's birthday party that I had to put aside Eone's costume. 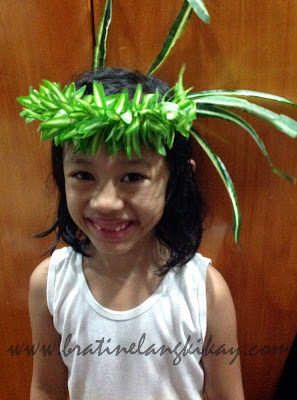 Three days before the event she reminded me that she didnt have any headdress yet while pressing into my hands a sample photo of a girl wearing a headdress made of leaves. 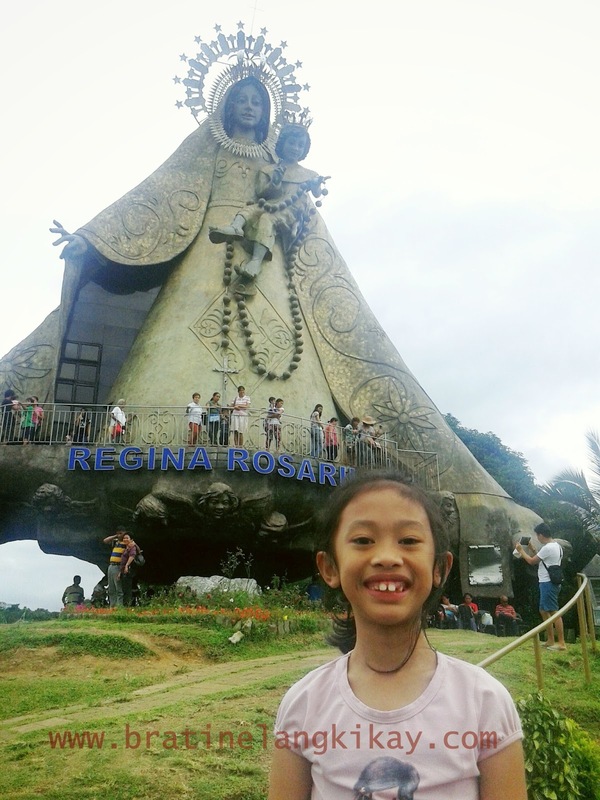 So taranta moment na naman. I quickly asked my mom to buy me the materials from Divi or even from our nearby market with specific instructions to get me floral wires and a leafy plastic plant. 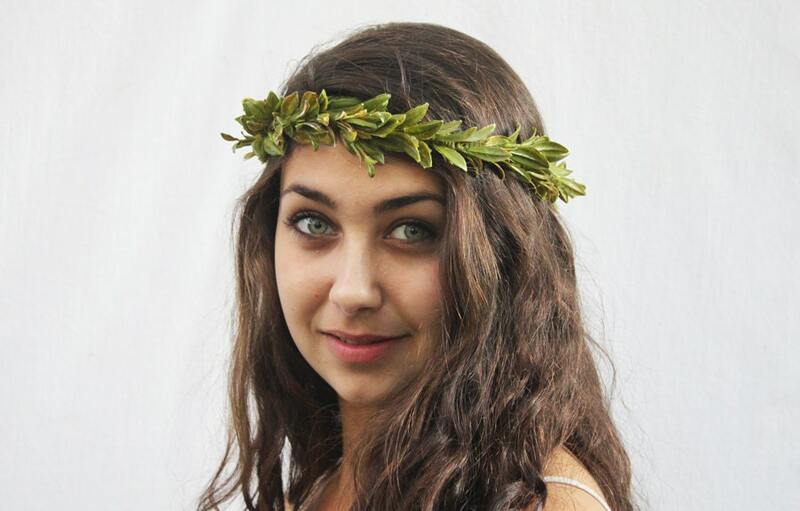 I was planning something like a leaf crown in Greek mythologies. When my mom came back from her Divi trip, she delivered to my office the materials and I almost fell off my seat when I saw them, especially the leaves. It was not what I want! It turned out Mommy's idea was to use the string 'leaves' but I inspected the material and they are actually flowers. Anyway, a desperate mom can improvise. Also instead of floral wires, Mommy got green twist ties. Hahaha! OMG. What to do, right? So to be able to work with them, I braided the wires and put 2 braids together to make a thick headband. 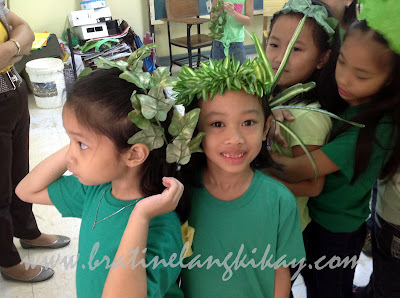 After that, I dismantled the green flowers and tied them around the braided wires to make it look like leaves. I didnt have enough green flowers to complete the whole headdress so I put the long thin leaves around the to give it a fuller look. When I finished the headdress, Eone was very excited and happy. She exclaimed, "It looks great, Mom! You're the best!". It made me want to make a dozen more! Another creation of her one and only MomGyver. I summoned The Hubby to the dining table to eat and he saw our fried pork chop staring sadly back at him. He murmurs, 'Eto lang?'. I rolled my eyes and quickly scanned our vegetable drawer in the fridge. The only thing I saw that is quick to cook is a bundle of Kangkong. Ah, another MomGyver moment! I decided to stir-fry the Kangkong with lots of garlic for a quick veggie fix. 1. Remove the leaves from the stem and rinse thoroughly. (Some prefer to include the upper stem. If you've tried the kangkong in Chowking, you'd notice they include the stems too). 2. Peel and mince about 6 cloves of garlic. 3. Pour cooking oil into a frying pan and saute the garlic. Stir in the kangkong leaves before the garlic turns brown or toasted (bec they might turn bitter). 4. Stir-fry continuously. Add about 5 teaspoons of water, a pinch of salt and a dash of pepper to taste. If you have a Garlic Magic Savor in your kitchen, add a teaspoon. 5. Remove from fire and serve immediately. An order of this in a restaurant costs about Php100 but you can cook this for a low cost of Php20! 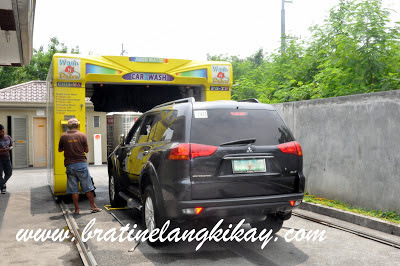 When I was a kid, I was very amused to see in the movies cars going through a passage way and emerging clean and shiny. As a child, anything automatic or robotic is something we associate high-tech, magic, and the rich and famous . Needless to say that I've always wanted to go through an automated car wash and enjoy the process while inside my car. Yeah, you can call me silly. 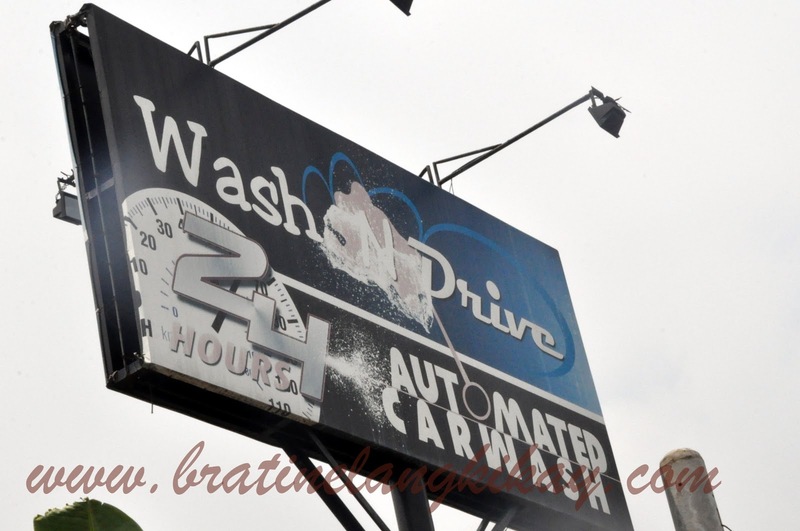 So imagine my delight when I saw a sign 'Wash N Drive' at the entrance of Village East Executive Homes along Felix Avenue in Cainta. 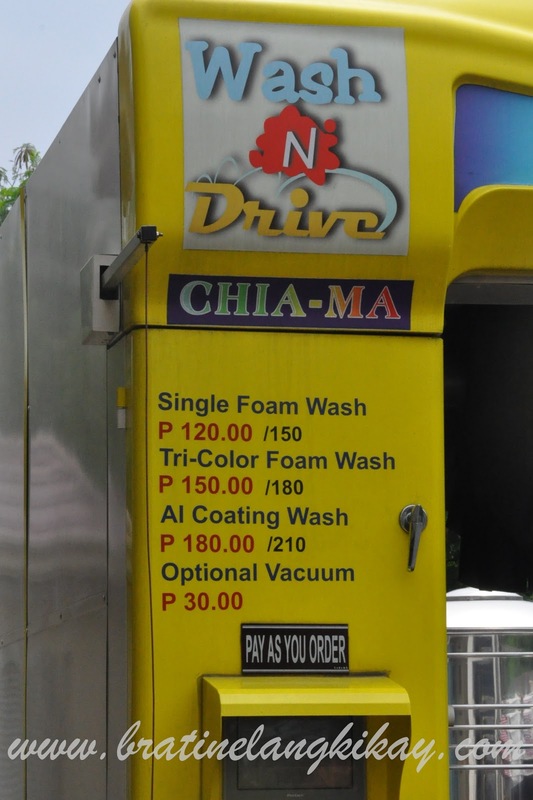 I thought it's just an ordinary car wash establishment but when I saw the drive through set up, I knew it was an automated car wash. I didn't tell The Hubby my discovery until yesterday when we had to have the SUV cleaned in a jiffy. Of course, we are suckers for anything new, fad or novelty. Okay, so the assistant asked The Hubby to position the vehicle to their designated mark on the floor. After which, they immediately taped all the wipers, folded the side mirrors and asked us to lock the windows. I reminded The Hubby twice about the window locks as we were with Eone and Enoe who both might get too excited (or scared) and open the windows accidentally. We chose the AI Coating Wash as according to the technician, it can remove light scratches and the coat will make the rain water glide/slide smoothly off the paint. For a fee of Php180, it's quite expensive but it comes with free vacuum and tire black. The entire process takes about 4 minutes, add another 15 minutes for drying and vacuum cleaning. Here's our video which I find funny because our daughter can't hide her amusement. For the quality of the cleaning, I'd say manual cleaning is still better. After all, they also had to wipe the car dry so it shines like how they say it would. It's hard to say if we're happy with whole experience. For one, the kids LOVED it. Were you able to count how many times my daughter exclaimed, "This is the coolest thing ever!!"? They enjoyed it like it was a ride at a carnival. I'd say this might be worth a try just for the experience. If you have kids, they'd definitely love it. I have big plans for my blog this year. I feel like it's time to take it to new level and start putting more videos, be more creative and make it more juicy The challenge is I am not fond of videos, probably because I need to edit them to make them worthy and that takes a lot of time. When we had our annual party at the office, I put together in a video of the highlights of the party and sent to our boss/headquarters in Australia. I tried various video editing software in order to get the job done (basically downloaded free or trial software so I can try first which one is suitable for a non-techie like me. Boy, I had a difficult time getting it done as compared to just editing photos in Picasa! Here's the outcome. Although I am somehow satisfied with it, I wish I could do it better next time. Now the next (and easier?) step is to save the video in a good format and media. I needed to send the videos (including the raw files) to a few people so a CD or DVD copy is a must. I also don't want to waste my work by losing the file so I got old fashioned and burned them in DVD. And there's where another road block came. I didn't know how to 'burn'! I thought I'd be stuck but thankfully I found a burning software from Cyberlink. Speaking of burn, it's a weird term don't you think? Burn can be a means to destroy but in computer terms, burning is a process of saving. Twenty years ago, the word 'burn' was associated with fire. If someone comes to my mom and asks her, "Can you burn these for me?, she'd probably get a match from the kitchen. I like burning (but not of things). I take comfort in the idea that I have copied of my children's photos, my travels and special occasions tucked neatly somewhere. And now that I've discovered a great tool to help me, editing videos, saving and burning them will be as easy making fire (with the use of a match). This beautiful pink kikay checkbook wallet is the work of my Darling Sister. She's always been fond of handicrafts, particularly sewing and crochet, since our high school days. While I could not even sew a straight running stitch, Darling Sister can do embroideries, cross stitch and make a dress using our good old sewing machine. I love it! not only because it's pink and uniquely chic despite being old fashioned, but because this was made specially for me. No copies, I hope. Thank you, Darling Sister. Next time you make me a long dress, okay? My little boy turned three last Friday. It marked his graduation from the Terrible Twos and boy, am I very happy! 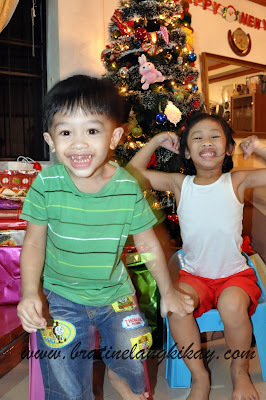 When he turned two, he was transformed from a meek and quiet boy into a rambuctious, frisky and naughty mini-spider man. He started climbing anything he could - our dining table, sofa, the windows, cabinets and even the railing of our stairs. Jumping also became his favorite sports and our beds are taking a beating. Then he discovered the technology called Tablet and have never stopped playing games since which is somehow good because it made him settle down and gave the house some quiet time. Exactly a week now after his birthday, it seems he is more active and more curious. I think I'd better put termporary cover to our power outlets and sockets, unplug the shower heater and padlock the gate. Terrible Twos is over and we are coming into a new phase I could fearlessly forecast as Terrifying Threes. I am welcoming it with more love and heaps of patience anyway. 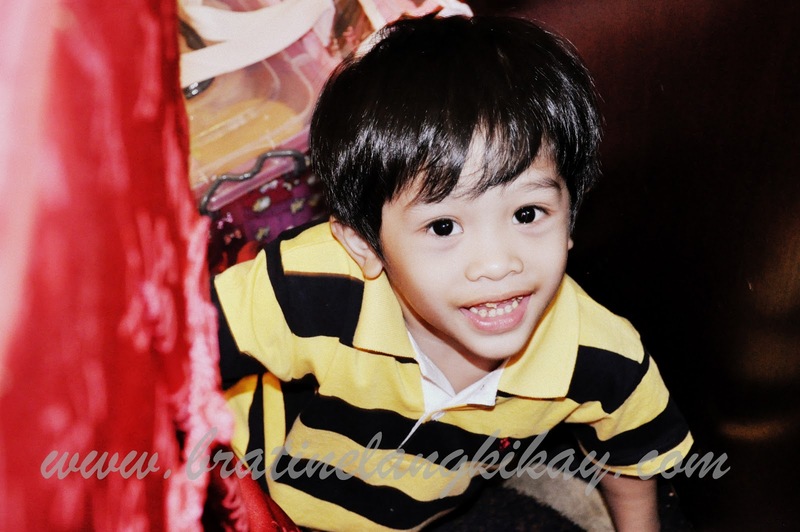 Happy 3rd Birthday, my darling Buboy!